Perhaps as incredible as any sight in Venice is that completely unexpected experience of seeing the city for the very first time. It is as remarkable a memory as any you carry away from the place. And yet, it is impossible to share this feeling with anyone who hasn't been there. A century ago, Claude Bragdon, an architectural writer on tour in Venice, was all too aware of this dilemma in reporting back to his journal in the states. "Everything I had read was clean forgotten-- swallowed up in wonder--and during my first moments on the Grand Canal I suffered from a sort of indignation that no one had in any way prepared me for what I found there ... The charm of the place is indescribable, that men through all the centuries have tried to utter it, and I was witness to their failure ... How should one convey the idea of light to a blind man or of such color as is there to dwellers in the gray-brown cities of the North? Venice is a shattered rainbow, built into a city." A big problem in describing what the city is really like is that traditional reliance of focusing on landmarks and the town's basic configuration of roads and buildings to get the point across [suggesting that one could describe Venice as one does any other place] simply doesn't work. The essence of the city extends well beyond the Piazza San Marco or crossing Rialto; rather, it lies equally within the character of hundreds of anonymous paths that really show you Venice while incidently getting you to the more well known sites. To help convey the mood and spirit of Venice, I've looked back at my impressions of the city as artistic form, shaped by many visits to the Laguna during winter, fall and spring, and thought about how I've come to see this remarkable place. And in the process, I became aware that it was more than the physical elements observed which were playing on my emotions. When I first passed through the railroad station Santa Lucia out onto the Grand Canal, a smile stretched wide across my mind. How absolutely incredible were the colors of the jagged pastel walls rising across the canal, set off by the water's dark rich hue and the brilliant late afternoon sunlight of that fall day. But what struck me as much as the sheer beauty of the city was the immediate thought of what kind of crazy people would build a place like this. Palazzi rise out of the water like the thousands of light posts that guide navigation around the Laguna. Walls are painted like canvas. Narrow paths--designed only for people---are carved between the dense setting of buildings forming a labyrinth that weaves circuitous routes through what seems less like a city, more a museum of constantly changing views, each one a painting in itself. Like Paris, the city's rich visual quality lies in a tight architectural fabric that knits together blocks and sestieri. The bulk of this fabric--or mass--is simple vernacular design: rich, colorful textures of masonry walls; asymmetrical fenestrations that distinguish one house from the next; elegant lines of arched windows, doors, and passageways; and the overall appeal of buildings scaled for people. These surfaces read like stage sets, framing a diverse network of walks that channel the visitor in and out of intimate passages, across small squares, emptying one into campi and fondamenta. The constant juxtaposition of side and frontal views of buildings creates an almost cubistic look, as if Braque and Picasso had gotten together to shape the place. This has the wonderful effect of further contorting perpective and orientation: "Am I in front or back of this building? Which path should I take? They all are pulling my attention, telling me 'this way'." Though completely familiar with the city, I still get easily turned around and lost the moment I deviate from the paths charted by signs marking the direction for Ferrovia, Accademia, or San Marco. But getting lost is one of the things Venice is all about. And it really doesn't matter which way you wander because you'll always end up in front of Ferrovia, Accademia, or San Marco. Venice gives you hundreds of choices and yet none at all about where to go. 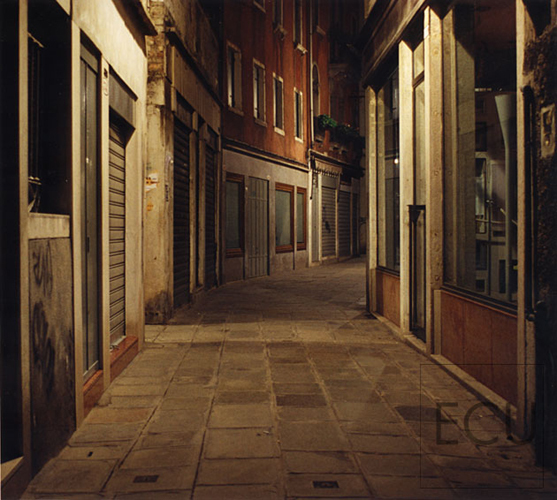 And this experience is intensified at night when even the most familiar walks become strange and uncertain as the dim glow of street lights, which seem to have been intentionally set too far apart, ensure that much of Venice is in near darkness. This bizarre state of being--feeling lost then found then lost--shouldn't be a surprise. Venice is full of the unexpected. And the more you experience, the more you realize that there is something strange going on that's been affecting the way you feel about the place because, ultimately, Venice is contradiction. Nearly devoid of nature, Venice is hundreds of islands tied together in the middle of the Laguna. There's the breadth of the Grand Canal, yet behind her facades run claustrophobic paths. Buildings everywhere appear pitched, some seemingly ready to collapse into canals. And yet inside, magnificent interiors can be found. At night, even in the most populated districts, windows are shuttered closed, not a trace of light escapes, no one seems at home. Back in daylight, the rich variegated colors of masonry walls hundreds of years old appear precursor if not outright inspiration of modern abstract painting. Even thousands of miles away, the city continued to confound me. In my viewfinder, I saw masonry and pigment cast into remarkable composition. But what I often found developing in the darkroom were images depicting a mysterious, haunting place lacking the warmth and spirit that is Venice and her residents. I then thought about how strange Venice is often made to appear in movies, and I then thought back to Carnevale. Carnevale is one of the city's more preposterous features and is very much Venice. All of the masks I had seen displayed in stores across the city were brought to life in small parades. Nothing much dramatic happens during the holiday, an outdoor masquerade with the city as stage. The celebration is pretty much based on the simple pleasure of being--or perhaps more accurately put, of being someone else. And herein lies the paradox. The holiday seems less joyous than it is derision, deception, a silent black laughter coming from behind painted masks. Costumes are couturiel wonders. But there is a sinister air about some, almost nightmarish, something out of Poe. Carnevale seems as mysterious as the city itself: festive, yet with a bizarre twist that totters between theatre and the grotesque, like gargoyles laughing at one another. The experience of Venice is as much fairy tale as it is reality. She treats your senses to rare sights and then challenges them to acknowledge that what you are seeing actually exists. In realizing this, I no longer wondered why images could tell only part of her story? And this must be the ultimate paradox: a city that inspires artists of all kinds from around the world, all realizing that the spirit that has touched and intoxicated can never be conveyed to those who haven't been there. But some extraordinary paintings do indeed come close to bringing one to the Laguna: Renoir's fiery sky in his Fog in Venice; Sargent's luscious shades of pinkish browns in his nearly monochromatic Par Temps Gris. Perhaps the least realistic but most striking images are Turner's tempestuous abstractions of the Grand Canal. What these artists saw was not what you see touring with your eyes wide open, but what you take in when they are nearly closed, as if trying to correct for nearsightedness. But instead of clarity, you seek the opposite effect--relaxed, unfocused sight, reading only light, form, and color. It's like seeing Venice in memory, through the rich imagery that's been scored in your mind, a subjectless impression fired by the romance of the city. From the introduction to a 1993 exhibition at the Casa Italiana in New York.